Learn bluegrass picking from one of the best there is. 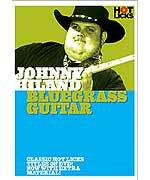 Johnny Hiland teaches rapid-fore flatpicking techniques, special bluegrass runs, hammer-ons and pull-offs, slides, rhythm strums, bluegrass fills, and much more. The disc also features some acoustic bluegrass jam sessions with Arlen Roth and Mac Wilson. You'll be pickin' and grinnin' right from the first lick!